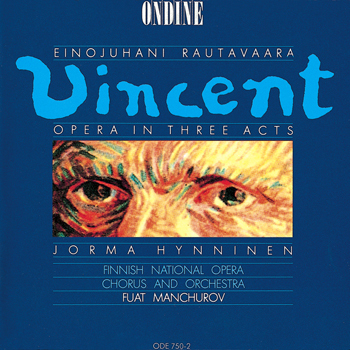 This double CD contains the three-act opera Vincent by Finnish composer Einojuhani Rautavaara who also wrote the libretto. It tells the story of the Dutch Post-Impressionist painter Vincent van Gogh (1853-1890). Rautavaara wrote the opera in 1986-87 on commission from the Savonlinna Opera Festival. The recording was produced in collaboration with the Finnish National Opera in May 1990 and was made shortly after the world première, featuring the same performers. Juha Kotilainen: Chief Warder / Chief of Police / Critic.